What is a mini CCTV camera? Arbitrarily we can say that a mini CCTV (Closed Circuit TeleVision) camera is any camera that is smaller than the majority of CCTV cameras sold as "Standard" sized cameras. But generally, when the term "mini CCTV camera" is used, reference is made to the small cameras normally used for covert recording. What is a mini CCTV camera? Arbitrarily we can say that a mini CCTV (Closed Circuit TeleVision) camera is any camera that is smaller than the majority of CCTV cameras sold as “Standard” sized cameras. But generally, when the term “mini CCTV camera” is used, reference is made to the small cameras normally used for covert recording. Thanks to modern technology, anyone can own a mini CCTV camera. Just a few years ago, these cameras were so expensive they were cost prohibitive for the individual to own, if they were even available at all. Today, not only are they affordable but they come in a wide range of types, each designed to satisfy a specific purpose. To understand how this is possible, let’s take a look at the technology behind a typical contemporary digital video camera. Most of today’s video security systems consist of three basic components: Camera(s); Digital Video Recorders or DVRs; and Monitors. Here is how an average digital video security system works. The camera captures the video image and sends it to the DVR where the data is saved as a digital video file. Actually, this file can be viewed live on the monitor and/or saved on the DVR for later viewing or archiving. The key behind the mini CCTV camera lies in how the camera captures the video images. Digital video cameras use an integrated circuit sensor chip to transfer light energy into electrical energy. There is usually one of two sensor chips used; either a Charged Coupled Device or CCD or a Complimentary Metal Oxide Semiconductor or CMOS. These sensor chips come in a range of sizes with the larger sizes usually producing a larger higher quality video picture. Most miniature wireless security cameras use a 1/4 or 1/3 inch CCD or CMOS chip, so the camera can be incredibly small. Of course, another contributor to their small size is the incredibly small, integrated circuits that prepare the video data and send it via an on-board transmitter (wireless) or via a video transmission cable such as RG59. These 1/4 or 1/3 inch sensor chips usually provide a minimum 380 TVL high resolution black and white or color picture. That’s a pretty good size video for a camera with a lens the size of a pin head. In addition, these miniature cameras also employ the use of wide angle lenses that provide an extended field of view for the camera through the small opening. The mini CCTV camera unit itself can be incredibly small as well. Since the camera is so small and light, it can be mounted almost anywhere. Better yet, for more truly covert recording needs, the camera can be imbedded within another object without anyone ever detecting the camera’s presence. 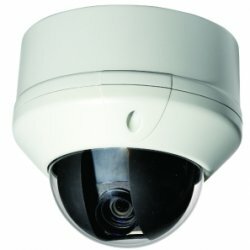 These cameras make great security cameras because you can monitor your surroundings without anyone realizing a camera is present. This can be very useful when you suspect you may have an unauthorized individual tampering with or stealing your possessions. The Button Cam – It takes the place of a shirt button and it even includes five extra buttons so they will match up. The Screw Cam – This camera looks like an ordinary Phillips head type screw. The Wall Clock Camera – It looks like a typical office-type wall clock however in addition to the functioning clock, a camera is packed inside. Desktop Speaker Cam – Functioning desktop speakers with a miniature wireless security camera hidden inside. Exit Sign Camera – Appears to be a normal indoor “Exit” sign. No one would suspect a camera is mounted inside. Stuffed Toy Dog Baby Cam – This camera comes with a handheld LCD monitor and also monitors audio as well as video. Although it does not record video or audio, it helps you keep a watchful eye on your baby without disturbing him or her. Vanity Mirror Camera – A double sided vanity mirror with a camera inside. Most miniature wireless security cameras come with power supplies or battery packs and Security Camera King includes a free 2.4 GHz receiver with most mini CCTV cameras. One of the smallest cameras in the line of surveillance cameras are the micro security cameras. They are small enough that they can fit inside of a pen or on the tip of your finger. Basically, the cameras are able to fit anywhere you choose to put them. It will provide you with the complete security you need right where you want it. Due to its small size, it is one of the best assailants on the market today when it comes to defense.